SOFIA—A new Enlightenment Stupa has opened in Moscow’s Otradnoye District. More than a dozen Buddhist teachers from different traditions were present to consecrate the 15-meter-high stupa on 16 September, led by Kundeling Tatsak Rinpoche. The ceremony was also attended by several hundred Russian Buddhists. The new stupa forms part of what will become a Buddhist temple complex called Thubten Shedrubling (Tib: Center for Study and Practice of the Buddha’s Teachings)—a name bestowed by His Holiness the Dalai Lama. When it is completed, the complex will function as a social and cultural center for the benefit of cooperation between the representatives of different nationalities and faiths in Russia. The construction of the stupa and temple, part of the Spiritual and Educational Complex of Russian Traditional Religions in Otradnoye, is one of the principal objectives of the Moscow Buddhist Society. This unique project has received the support of the city government, a deputy of the State Duma of the Russian Federation, deputy chairman of the Moscow Buddhist Society’s board of trustees I. D. Kobzon, and residents of Otradnoye. The new Enlightenment Stupa. Image courtesy of Baatr U. The Enlightenment Stupa (Tib. jang chub chorten) is one of eight traditional stupas in Vajrayana Buddhism that symbolize major events in the Buddha’s life,* representing the moment when Prince Siddhartha attained enlightenment and understood the true nature of all phenomena and the potential of all beings to attain spiritual realization. It is considered the most significant because it symbolizes the final attainment of Buddhist practice and also has the power to dispel obstacles. The project has been ongoing for several years: the mayor of Moscow signed an order approving the construction of the temple complex and stupa in 2000. In 2004, the Dalai Lama blessed the project, but it was not until the end of October 2014 that the Moscow Buddhist Society received an official building permit and related approvals. In 2015, a prayer wheel was erected within a structure named the Pagoda of Heaven near the site of the future temple, and has since managed to collect more than 10 million prayers. 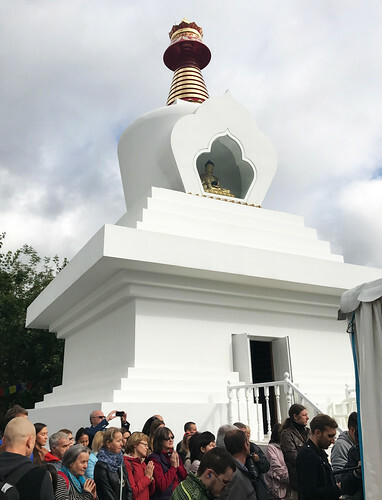 At the opening ceremony for the Enlightenment Stupa, the chairman of the Moscow Buddhist Society, Dulma Shagdarova, addressed the huge gathering of devotees. She explained that the stupa represents the body, speech, and mind of the Buddha, and is filled with holy images, mantras, prayers, sacred texts, statues, relics of saints, offerings, and other sacred objects weighing a combined 20 tonnes. Among the sacred objects are 34,442 clay statues of deities and stupas (Tib. tsa tsa), along with protective mantras (Tib. zung) from Mindroling and Namgyal monasteries in India, sacred medicine (Tib. men drub), mandalas of wealth deities, and sand from more than 15 mandalas of different deities. The consecration of the stupa was lead by Venerable Kundeling Tatsak Rinpoche. Born in Lhasa in 1983, Rinpoche left his homeland at the age of 10 to undergo training in Buddhist philosophy at Drepung Gomang Monastery in southern India. He has repeatedly visited Russia, Mongolia, and Europe on behalf of His Holiness the Dalai Lama. Kundeling Tatsak Rinpoche was invited to Moscow by the Drepung Gomang Center, with the help of the central khurul (temple) in the Republic of Kalmykia—the Golden Abode of Shakyamuni Buddha—and the Save Tibet Fund to consecrate the stupa and deliver a series of lectures. From 12–17 September, he gave commentary on Lama Chöpa (Skt. Guru Puja), the root text of the Mahamudra tradition of the Gelug and Kagyu schools of Vajrayana Buddhism, and empowerments of Green Tara, Vajrapani, and White Mahakala. The consecration of the stupa is a new milestone in the history of Buddhism in Russia, and a welcome addition to the Buddhist landscape of Moscow alongside the Enlightenment Stupa built on the grounds of the Nicholas Roerich Museum in 2008, with the blessing of His Holiness Dujom Sangye Pema Shepa Rinpoche—the head of the Dujom Tersar lineage of the Nyingma school. The Roerich stupa commemorates the 80th anniversary of the Russian painter, author, and archeologist N. K. Roerich’s Central Asia expedition, and was funded by Tsewang Jangchub Gatseling Monastery in Nepal, Tibet House Moscow, and private donors. * Along with the Enlightenment Stupa, the eight traditional stupas are: the Lotus Blossom Stupa, the Stupa of Many Doors, the Stupa of Descent from the God Realm, the Stupa of Great Miracles, the Stupa of Reconciliation, the Stupa of Complete Victory, and the Stupa of Nirvana. New Buddhist Temples Coming to Moscow!